It’s probably the oldest investment adage: buy low, sell high. So what is “low” today? And just as important, what is “high” that we should avoid buying? As Mike Maloney points out in his new video of the Top 10 Reasons he buys gold and silver, everything is a scary investment—except precious metals. Since its 2009 low, the broad stock market is in the midst of one of its longest bull runs in history. This fact tells us now is not the time to buy general equities. 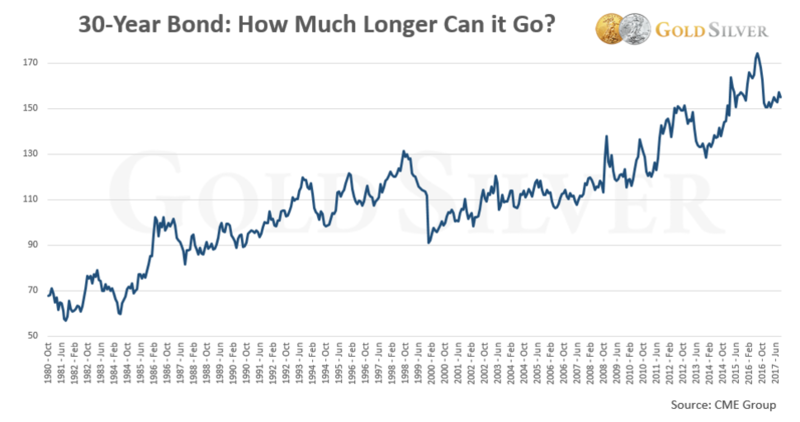 Government bonds are even worse. They’ve been in a bull market for 36 years! Not only are bond yields terrible money-making investments, but as Mike says, the global bond bubble dwarfs anything in history. Current bond prices clearly do not represent buying low. They’re way overvalued, and after a three-decade run will sooner or later suffer a catastrophic decline. The average US house is now priced above its 2006 peak, one of the biggest real estate booms in history. And this run-up has occurred in just five years. What’s scary about this bubble is that a big chunk of it is the result of institutional investors… as a group, they’ve purchased almost one-third of all foreclosed homes since 2009. Once real estate begins to crash again, they could quickly dump them. Either way, it’s clear that now is not the time to buy real estate, either. You’d be buying at or near the top of another bubble. 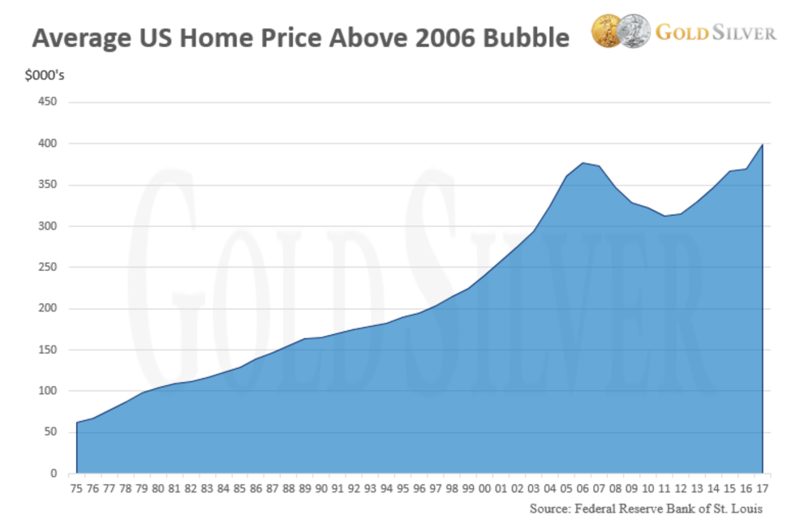 Gold and silver were last in a bubble in 1980. Because of the monetary crisis that’s headed our way, they will be the next great bubble. Most developed nations have been continually printing money and piling on debt, and still can’t balance a budget even 10 years after the financial crisis! None of this is sustainable. 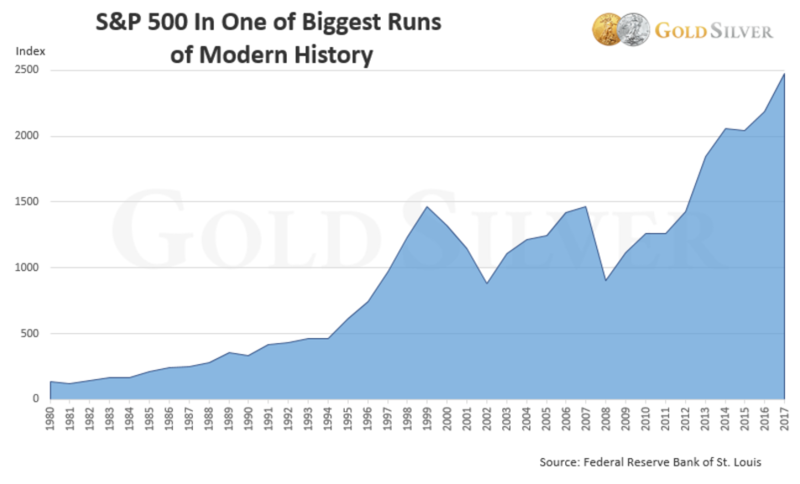 And there will be a reckoning: history shows that gold and silver prices have always accounted for all the excess currency that’s been printed—and given that that excess is at an unprecedented level in history, their prices are almost certain to be the next great financial bubbles. Those percentages are not misprints! Gold and silver have had strong returns in 2017—but these gains are miniscule compared to how much they’ll rise in a bubble. The bottom line is that of all the major asset classes, gold and silver represent the best opportunity to buy low. • Watch Mike’s short video to understand Top Reason #6 he buys gold and silver. And buy the only undervalued asset class available today.